This past Saturday was the Dodgers family day picnic, and Jon SooHoo of the Dodgers was kind enough to share some pics. 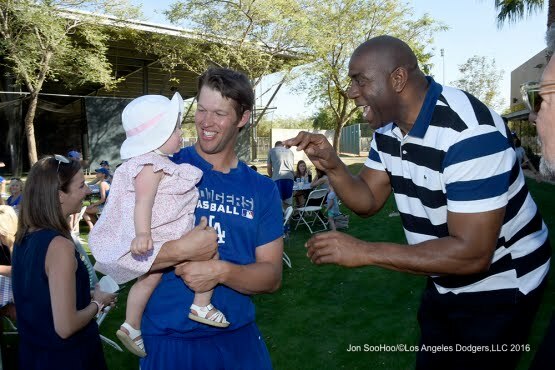 Check out Magic Johnson entertaining Clayton Kershaw and his young daughter in the photo above. Go here to see a few more photos. Another prospect top get excited about. Via Josh Norris at Baseball America, "Dodgers’ Alvarez Dazzles On Back Fields." Alvarez used a loose, whippy arm to generate lively fastballs that started out in the low-90s and eventually built to the mid-90s before touching 99 mph near his outing’s end. He coupled the pitch with a low-80s slider that garnered swings and misses as well. Chan Ho Park recently visited with Hyun-Jin Ryu at Camleback Ranch. Via Ken Gurnick at MLB.com, "Park: Ryu can inspire with successful return." "Young players watched him and saw you can make the Major Leagues, but it's even more important now for young pitchers to see his recovery and see him come back and pitch well," said Park. "Many young pitchers in Korea are injured and stop playing and we never see how good they can be. And we don't have that many like Ryu. "So we need to learn from Ryu and from the Dodgers and their system to save our young pitchers. That's my hope and dream. If I opened the door for pitchers to come over here and play, he can open the door for pitchers to recover from injury and return." Andre should be OK. Via Doug Padilla at ESPN, "Hobbled Andre Ethier says foul ball gave him a 'dead leg'"
"I squared myself up pretty good right there," Ethier said. "I wasn't sure if it hit off the ground before it hit my leg or not, and then someone watching the replay said I direct-lined it. It's just one of those plays that happen. My leg is littered with scars and marks from doing that over the years." ICYMI: one-time Dodger Chone Figgins to officially retire, via Mark Polishuk at MLB Trade Rumors. Panini America shares a bunch of great pics and video of the San Diego Chicken's recent autograph signing in Santee (Link Here). "At this point, we'll see," Roberts said when asked who his fifth starter is. "I don't know how long [Bolsinger's] oblique is going to last and how serious it is. Obviously, there's Zach Lee, and I don't know where Beachy is right now. "It just keeps happening, I guess. Bolsinger has a mild oblique strain, whatever that means, and whatever it takes we'll know as days go on. He'll get treatment and see where it goes from there. You win with pitching and defense. Look where we were at the start of camp and where we are now, it's a little frustrating. Every team goes through it in some capacity. It's another obstacle for us to deal with."